Advanced radical technology for combat vehicles has recently been demonstrated for the US DARPA’s Ground X-Vehicle Technologies program. A series of demonstrations, such as the last one at Aberdeen Test Center held in May, has given potential military service transition partners an opportunity to observe technical progress on the GXV-T program. 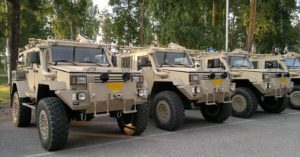 The Defense Advanced Research Projects Agency (DARPA) Ground X-Vehicle Technology is a project that aims to develop technologies and designs to create lighter armored military vehicles. GXV-T program focuses on enhancing mobility, survivability, safety, and effectiveness of future combat vehicles without piling on armor. The new technologies will enable the vehicles to travel quickly over different terrain while enhancing situational awareness and ease of operation. GXV-T combat vehicles of the future will be able to traverse up to 95 percent of off-road terrain, including slopes and various elevations. Capabilities include revolutionary wheel-to-track and suspension technologies that would enable access and fast travel both on- and off-road. 8 contracts to a group of defense contractors and research institutes were awarded by DARPA to develop the technology. According to defense-update.com and darpa.mil.com. This entry was posted in New Technologies and tagged new technology, transportation, vehicles. Bookmark the permalink.